Is your dog comfortable in his own skin? Unfortunately, taking care of your dog's coat with a dog shampoo or dog comb of Furminator is sometimes not enough. Skin problems are very common in dogs, exact figures are not known, but a large number of dogs has suffered from skin problems whether acute or chronic. In this article, we will discuss a limited number of allergic skin conditions. The skin is by far the animal's largest organ and reflects an animal's general health. A reduced resistance or illness is often accompanied by skin and/or coat changes. In addition, the skin itself also has a multitude of functions. These include a barrier function: the skin protects the body against all kinds of external influences, trauma and infections. The skin also helps regulate body temperature, stores all kinds of useful substances and of course has an important sensory function. Animals with skin allergies can display a wide variety of symptoms. In many cases itching, redness, irritation and a rash are observed. This may be accompanied by hair loss, a dull coat, discolouration of the skin and scratch marks. Aside from these skin problems, recurring ear problems can also indicate an underlying skin problem. In that case, if concerns ear problems in which no bacteria, fungi, yeast or mites are found. A bad body odour or a red discolouration of the skin (usually visible between the toes) may also indicate skin problems. A light coat may turn a reddish colour due to prolonged licking as a result of chronic skin problems. Although dogs with skin problems don't usually look very ill, these animals are still clearly experiencing discomfort. 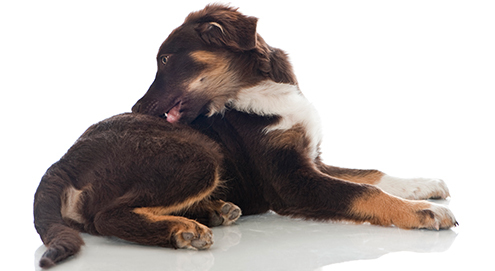 Itching in particular is a serious sign of compromised welfare in dogs. There are many underlying causes that can result in skin problems in dogs. In order to treat a dog successfully, it is essential that these causes are investigated. If we only treat the symptoms, the problems will often return in time, and it is like sticking plaster on a wooden leg. Often there are several factors that ultimately lead to clinical symptoms, this is the so-called "itching threshold". The substance that causes an allergic reaction in an animal is called the allergen. Dogs are often hypersensitive to various allergens, crossing a certain itching threshold, which leads to problems in the dog. It is as if various hypersensitivities accumulate. We will briefly discuss a number of causes. One of the most common allergies in dogs are flea allergies. Dogs that are allergic to flea bites have a hypersensitive reaction to the proteins in the flea's saliva. What follows is a very severe hypersensitive reaction with severe and persistent itching. In most cases, the itching is mainly around the hindquarters and base of the tail. This is where you will find scratch and bite marks caused by the dog. Even a single flea can cause this severe reaction. For this reason, you should strictly observe a flea prevention regime in these dogs! Hypersensitivity to certain food components can cause skin or gastrointestinal problems. It is often thought that an animal cannot have a food allergy if it has been eating the same food for an extended period of time. This is incorrect! An animal can in fact develop an allergy if it has been exposed to the allergen a number of times. In the vast majority of cases, dogs with food allergies react to a specific animal protein, such as beef or chicken. Only a very small percentage of allergic dogs have a hypersensitivity to a cereal. The only way to confirm and treat a food hypersensitivity is by changing the animal's diet. It is of the utmost importance that this diet is strictly observed for the first 6-8 weeks, so no other food, treats or chews can be given. The owner must also prevent the dog from eating anything whilst out for a walk. The suitability of the diet for your dog can only be established after this period, because it can then be excluded that a reaction was caused by the "old" food components in the previous food. There are two kinds of diets that can be administered to dogs with suspected food hypersensitivity. The first diet is one in which the proteins are hydrolysed. Hydrolysis ensures that the existing proteins are "cut" into smaller parts. As a result, the original protein is not recognised by the body and therefore the immune system does not react to it. A second option is a real elimination diet. Only 1 single new protein source is chosen, and it must be one that the dog has not been exposed to before. Suitable protein sources for elimination diets include venison, horse, quail, ostrich or rabbit. One of these proteins is combined with a carbohydrate, such as rice or potato, and a vitamin/mineral supplement. You can choose to prepare the food yourself (often in the initial phase) or to use a ready made diet. Trovet is a premium brand that offers plenty of elimination diets for your dog, and is available in our product range. In cases of atopy, the body reacts to innocent substances in the environment. For example, dogs can react to allergens such as mites (including house dust mites), animal skin flakes, certain types of pollen and grass. In most cases, an atopic dog will react to several allergens. In dogs with atopy, the first symptoms are often observed before their third year. Skin injuries and itching are mainly localised around the head, groin and paws. Atopic problems have a hereditary component. In addition to any supporting measures, it may help to start by desensitising the dog. This means that we try to reduce the dog's sensitivity to the allergens over time. This is done by administering injections that contain diluted allergens in increasing quantities. It can take a few months before this treatment shows any results. Sometimes we need to start with medication that can reduce the excessive reaction of the immune system. This will often strongly reduce the skin problems. A diet that can be used when your dog is suffering from atopy is Specific Allergy Management Plus COD-HY/COW-HY. What can your veterinarian do for you? In dogs with skin and itching problems, it is important that we accurately map the problems in order to examine which underlying problem is causing the symptoms and whether there is any additional infection. To do this, microscopic examination of skin flakes, fungus tests, bacteriological research, blood work, skin biopsies and of course allergy tests can be used. This diagnostic work is needed in order to find a suitable treatment and to give the dog the best possible chance of improvement or recovery from the complaints. If we only treat the symptoms, we will not find a permanent, long-term solution for chronic skin problems. Your veterinarian can help you with this or, if necessary, refer you to a veterinary dermatology specialist. In order to support a dog with skin problems as best you can, there are various measures you can take. Keeping the skin and coat in optimal condition is important for the prevention of clinical symptoms. Alongside any medication to be administered, a good skin care routine of crucial. Essential fatty acids are important for a well-functioning skin barrier. It contributes to the recovery of the moisture balance and the structure of the coat and skin. This increases the skin's resistance, so that it will not be damaged as easily. Existing skin reactions are reduced. These fatty acids can be administered in the food or as supplements. In addition, pipettes are also available that reinforce the skin when used on a regular basis. In the event of an underlying hypersensitivity or food allergy, a special diet should of course be the first step! Aside from the fact that certain allergens can be avoided in this way, these diets contain the essential nutrients to support the underlying condition. Essential fatty acids have often already been added to these diets, as have supplementary vitamins and minerals. It can take a long time to find the ideal diet. An elimination diet must be strictly observed for 6-8 weeks before the effectiveness can be assessed with any certainty. When a diet does not lead to sufficient improvement, the same process must be followed with a different diet. Taking good care of your pet's coat is important in the prevention of skin problems. This includes brushing the coat weekly and, depending on your dog's coat, regular visits to a dog groomer. Getting the skin into optimal condition and keeping it that way can help to reduce the occurrence of skin reactions. Even when skin problems have already been observed, caring for your pet's skin can contribute to an improvement of the symptoms, a quick recovery and prevention. First and foremost, it is important to wash dogs with skin problems regularly using a suitable shampoo. This removes dirt, micro organisms and any possible allergens from the coat. At the same time, the shampoo soothes the (itchy) skin and hydrates it. A proper dog shampoo that is recommended by many of our customers is Cowboy Magic. You should also ensure that the ears are kept clean, as allergic skin problems are often accompanied by ear problems. Many types of ear cleaners are available for this. Dogs of certain breeds may have small or larger skin folds. Skin folds usually occur around the snout and the base of the tail. In sensitive animals, these folds can lead to serious problems. There are various disinfecting and soothing wipes available, such as the MalAcetic Wipes. These wipes are specifically made for keeping these folds clean and dry. Allergic skin problems can seriously affect your dog's well-being. A proper examination, a suitable treatment and good support can result in a considerable improvement. Make sure that your dog is comfortable in his own skin! Suitable for hypoallergenic and elimination diets. Ideal for difficult to reach places. For dogs with food allergies or intolerance. For dogs with food allergies and skin problems. Wet wipes to care for and clean your pet's skin. For dogs & cats with sensitive skin. Helps repair the skin barrier. Cleans and purifies the skin & coat.